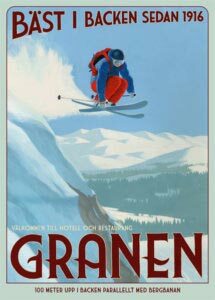 The Norwegian Biochemical Society (NBS) wish to invite you all to a two-day professional and social gathering at Hotel Granen, Åre!!!!! We will depart from St. Olavs 10th of April, and will return on the evening the day after. Transport will be by by bus, with a small “pitstop” for groceries etc. at Storlien. This is also an excellent opportunity for master and PhD students to present their research! and we strongly ecourage as many as possible to sign up for giving an oral presentation. (As an added bonus, speakers receive a discount on the meeting costs!). The meeting costs approx. 2300 NOK, this covers food and lodging in double room, as well as transport. Register by sending an e-mail to [email protected]. Please mention in your e-mail whether you wish to present your research and who you wish to share room with (only doubles available). Final registration date is Febuary 5 th. We hope to meet many of you at Åre! Oppdalsmøtet 2017- New deadline: February 7th!!! 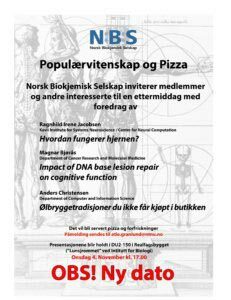 The Norwegian Biochemical Society (NBS) wish to invite you all to a two-day professional and social gathering at hotel Skifer, Oppdal http://www.skiferhotel.no/. The science program will start at approx. 14.00 the 22nd of March, and will finish at 11.30 the day after. Transport will be by optional, but we suggest the participants to buy tickets for the train arriving at Oppdal 09.55. This is an excellent opportunity for master and PhD students to present their research, and NBS will cover 1000 NOK of the conference fee for participants that are selected to present their research as a talk during the meeting. The meeting costs approx. 2000 NOK, this covers food and lodging in double room. Final registration date is Febuary 7th. We hope to meet many of you at Oppdal! /wp-content/uploads/2014/10/logo-nbs.png 0 0 Lene /wp-content/uploads/2014/10/logo-nbs.png Lene2017-01-16 15:37:442017-03-25 18:58:58Oppdalsmøtet 2017- New deadline: February 7th!!! Arrangementet er gratis, og åpent for alle. Første del vil foregå på engelsk, mens de to siste foredrag vil være på norsk. 17:40: Geir Bjørkøy: Why was the Nobel Prize 2016 awarded to Yoshinori Ohsumi for his work on autophagy? 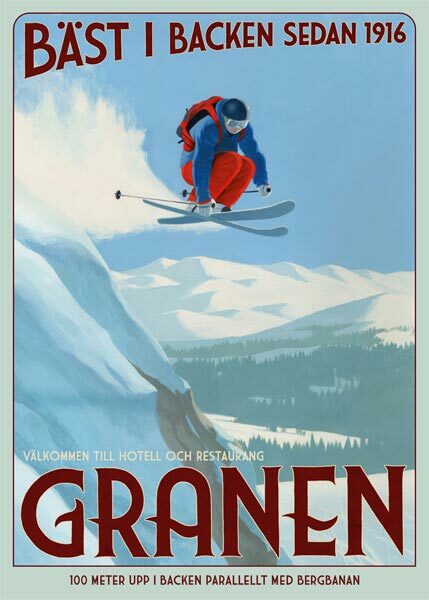 The Norwegian Biochemical Society (NBS) wish to invite you all to a two-day professional and social gathering at hotel Granen, Åre (Sweden) http://www.aregranen.se/en. The scientific program will start at 13.00 April 6. and will finish at 11.30 the day after. Transport back to Trondheim will leave at around 17.00, giving time to take part in the activities Åre can offer. Complete program will be available soon. 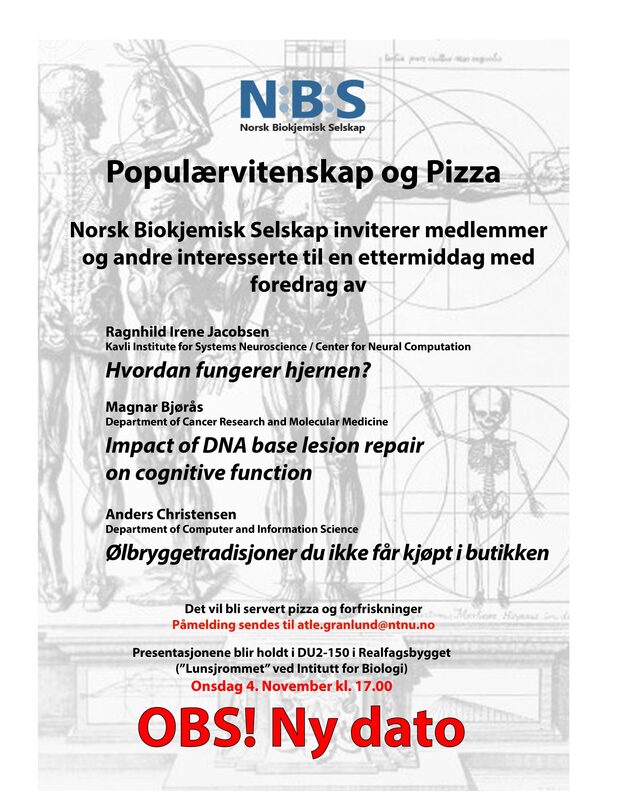 We hope to make this an excellent opportunity for master and PhD students to present their research and NBS will cover 1000 NOK of the costs for all participants that contribute with a talk. Register by sending an e-mail to [email protected]. Please mention in your e-mail whether you wish to present your research, if you need transport to/from Åre and who you wish to share room with (only doubles available). We hope to meet many of you in Åre! The Norwegian Biochemical Society (NBS) in Trondheim wish to invite you all to a two-day professional and social gathering at hotel Granen, Åre (Sweden) http://www.aregranen.se/en. The scientific program will start at approx. 12.30 the 6th of April, and will finish at 11.30 the day after. The transport back to Trondheim will depart at 17.00, giving time to take part in the activities Åre can offer. More information regarding scientific program and registration will be given soon. Det vil bli servering av pizza og forfriskninger. Deltakelse er gratis. Norsk Biokjemisk Selskap i Trondheim vil på kvelden onsdag 28. Oktober arrangere et populærvitenskaplig seminar for nye og gamle medlemmer. Det vil bli servering av pizza og forfriskninger. Deltakelse er gratis. Vi kommer tilbake med program og tidspunkt. The program for our upcoming meeting in Åre is ready. Looking forward to seeing you all at Hotel Granen. Vi håper at dette kan være en god anledning for både faglig og sosial utveksling mellom de ulike forskningsgruppene i regionen. Det faglige programmet vil løpe fra ca. 13.00 den 3. Mars til 11.30 den 4. Mars. Buss hjem går ca. kl 17.00 den 4. Mars. Endelig program vil bli sendt ut i løpet av uken. Vi ser dette som en ypperlig anledning for masterstudenter og stipendiater til å presentere sin forskning, og det er fortsatt mulig å melde sin interesse for å holde en 30-minutters presentasjon. Dette må da nevnes ved påmelding. NBS dekker oppholdet for stipendiater som holder foredrag, og for alle masterstudenter som ønsker å delta på møtet. Oppholdet ved Hotell Granen koster ca. 2000 kr pr. pers. Dette dekker da kost og losji i dobbeltrom. Påmelding skjer ved å sende e-post til [email protected]. I denne e-posten skriver dere om dere trenger transport med buss, og hvem dere ønsker å dele rom med (kun dobbeltrom ledig). MERK! Kort påmeldingsfrist! Påmelding må være sendt innen 13/2-2015. Håper å møte dere i Åre! Det vil bli flere interessante foredrag og vi serverer pizza. Hold av ettermiddagen! Programmet er under utarbeidelse og vil legges ut så snart det er klart.